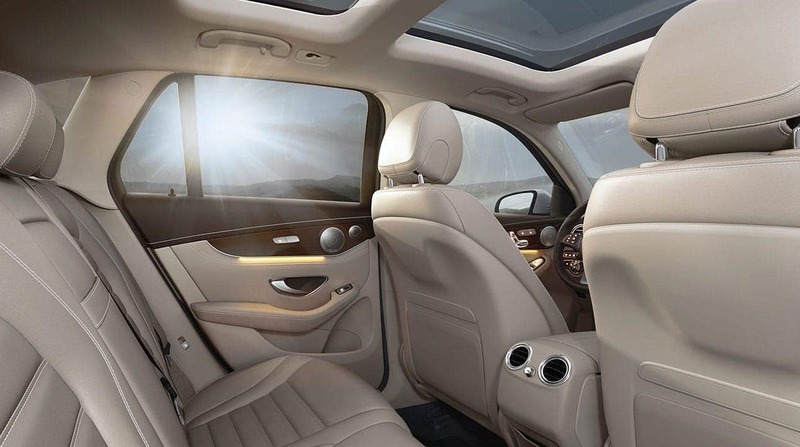 Drivers from Decatur will find that the 2019 Mercedes-Benz GLC SUV offers a roomy and versatile interior, loaded with helpful features to enhance your driving experience. This midsize luxury SUV comes with power folding rear seats and plenty of cargo space for hauling groceries, sports equipment, or gardening supplies. Learn more about the Mercedes-Benz GLC dimensions, then explore the GLC inventory at Sullivan•Parkhill Automotive Inc to find the model that will best suit your needs! The 60/40 split folding rear seats fold flat with the push of a button to increase cargo capacity, or you can just fold down the middle seat to carry longer items. If you have 5 passengers but need a little extra cargo capacity, the rear seats can be locked in a more upright position to make room for large or bulky items in the cargo area. The Mercedes-Benz GLC exterior also offers adaptable features such as power-fold the side mirrors which can be programmed to automatically fold flat when you remote-lock your GLC, and unfold when you unlock it. To learn more about the tech features, performance, and capability of the Mercedes-Benz GLC, stop by our Mercedes-Benz showroom near Mattoon. You can also learn more about the Mercedes-Benz A-Class too. We make it easy for you to value your trade-in, calculate your payment, and get pre-approved for a low interest loan. Explore our new vehicle specials, and please feel free to contact us if you have any questions.